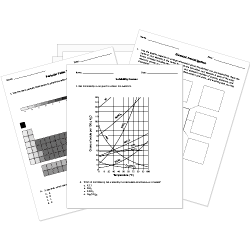 You can create printable tests and worksheets from these Acids and Bases questions! Select one or more questions using the checkboxes above each question. Then click the add selected questions to a test button before moving to another page. The table shows the pH of four substances. A substance that changes color when exposed to acid or base solutions is called a(n) . Which lists the substances from least to most acidic? A solution at pH 11.5 is . Distilled water with a pH of 7 is . What is the most accurate way to see acidity or alkalinity? Which substance is the most alkaline? An acid-base tells us whether we have an acid or a base. Soap turns green in red cabbage indicator, so it is considered a(n) . Which of the following would be most useful in determining if a substance is either an acid or a base? Which set of substances listed is correctly sequenced from most to least acidic? A liquid with a pH of 10 is . If I have a solution with a pH of 3, what is it? A substance with a pH of 2 is a . What can we use to show us that a chemical reaction is taking place? Which item is NOT an acid? Which of the following has the greatest concentration of hydroxide ions?